The era of screensavers as necessary tools has long past - the modern screensaver is more about pleasure and entertainment than nebulous security or hardware protection. 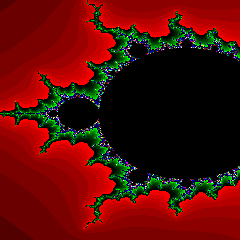 Mandelbrot Screensaver is a screensaver that automatically generates images from the Mandelbrot fractal, generating a never ending display of fractal images on your screen. 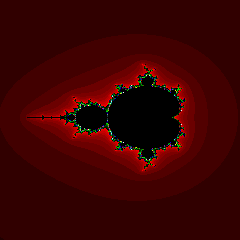 The Mandelbrot fractal is a mathematical curiosity that produces some striking images when magnified. 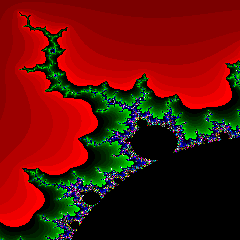 Geek Note: The fractal is found on the complex number plane in the region -2-2 i to 2+2 i. Each pixel in an image represents a single point from this region. The colour of a pixel is determined by the speed at which the sequence z(n) = z(n-1)^2 + z(0) tends to infinity. Phew! Configurable display structure and colours. This screensaver is released as Freeware - there is no charge for it. If you like it - keep it and pass it on to your friends. If not, try something else. If you have any problems with the screensaver, please email me and I’ll look into it. 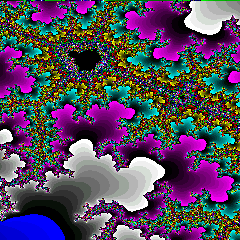 Here are some captures from my own machine showing the fractal patterns drawn by the screensaver. Note that these images have been heavily compressed for web display - this has made them slightly fuzzy when compared side by side with the originals.